My mom’s a huge gardener and she always has been. Even when she was a little kid, she spent her days helping my grandma in the garden. Now, even though she’s living in the middle of the city with a concrete patch for a backyard, she’s still growing as much as she can. I love going over to pick out fruits and vegetables. It’s kind of like having your own personal mini farm. And, as she always likes to remind me, it’s all completely organic. The other day I went to pick up some shredded cheese (yes, I often get calls from my mom telling me to come home to pick up random groceries she’s boughten me) and I saw her eggplant plants. They were gorgeous. She gave me a particularly large one to take home and I was ridiculously excited. I decided to slice the eggplant into sticks and shallow fry it before tossing it in a honey garlic sauce. 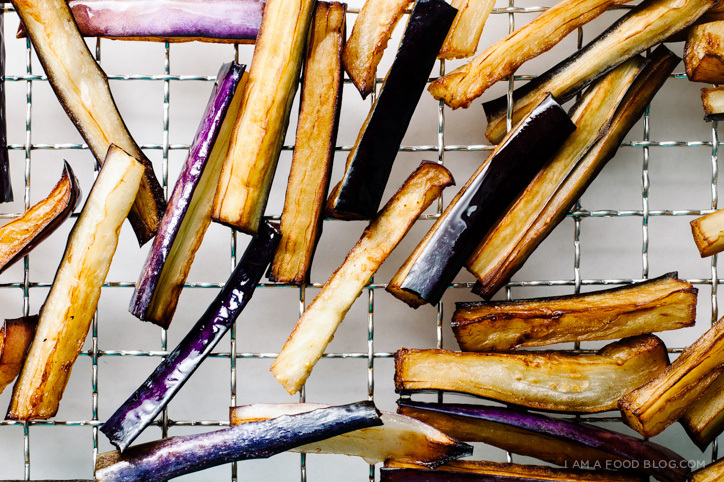 The benefits of high-heat shallow frying is two-fold: it ensures that the eggplant doesn’t absorb too much oil and also cooks it quickly so you have a somewhat crispy exterior and super-creamy interior. These guys were so, so good. I texted my mom to tell her and her reply to me was: taste the freshness. Mike and I laughed for a good five minutes about it. But seriously, this eggplant is fresh! Cut the eggplant into 3/4 inch sticks. In a deep-sided skillet, heat up 1/2 inch of oil over medium to medium-high until it reaches 360°F. Fry eggplant in small batches, flipping if needed, until lightly golden brown, about two minutes. Remove from the oil and drain on a cooling rack. In a small sauce pan, heat up a touch of oil and cook the garlic on medium heat until slightly golden, but not browned, 1-2 minutes. Add the honey, soy sauce and ground pepper. Turn the heat up to high so the honey-soy mixture bubbles, thickens and turns into caramel-sticky goodness. 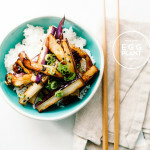 Toss the eggplant with the sauce and garnish with sesame seeds and green onions. Enjoy immediately with rice or grain of choice. I’m addicted to aubergine, I love when they are a bit chewy whilst being creamy and crisp. Must give this a go! I love aubergine: sweet and earthy. This looks beautiful and I can only imagine it tastes just as good. This looks incredible! Eggplant is big and beautiful in michigan right now so I will have to stock up! Loving the simplicity of this! And that flaaaaavour! Yum! Looks fantastic! Yay for eggplant season. 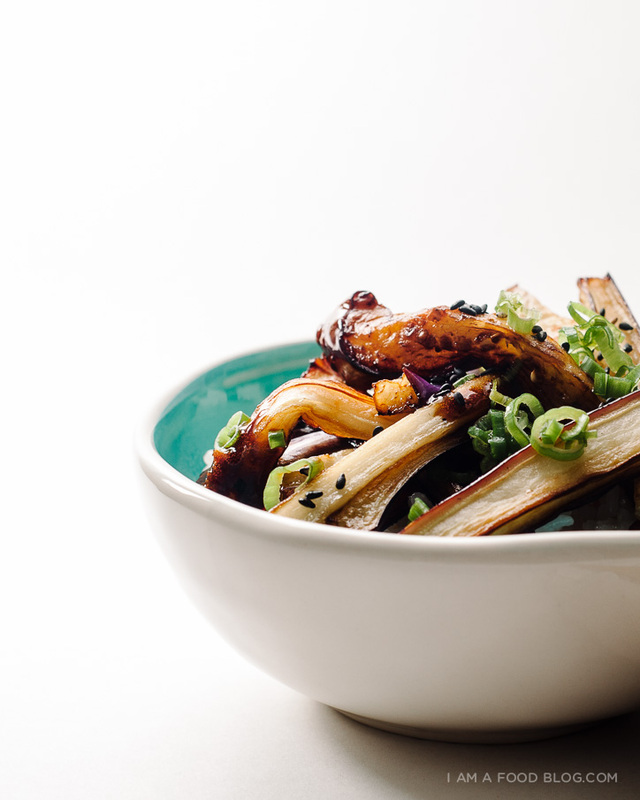 I have a similar recipe I love doing that involves a sweet soy sauce and fried shallots at the end. Delicious! Oh eggplant grow so abundant at my auntie’s place that she often bring up a bucket filled with them. Soy sauce and sweetness are instant comforting things for me! so yummy! 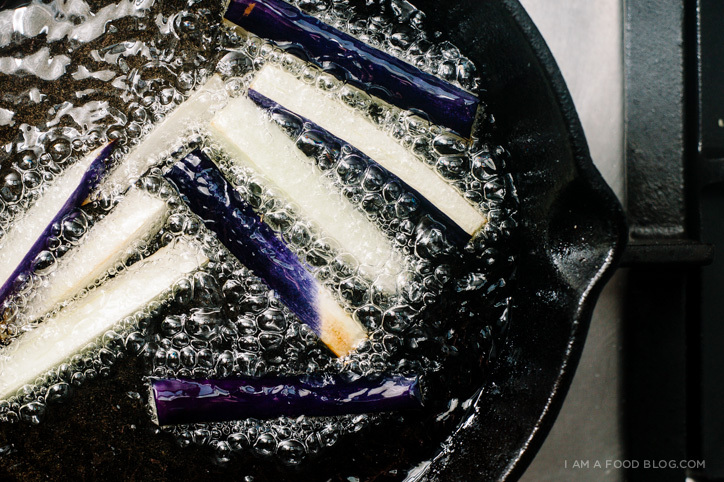 I love anything eggplant, but I’ve always been a bit skeptical about the benefits of shallow frying… Is it actually healthier? It always seemed counter-intuitive to me… But perhaps I’ll have to give this a try, but with locally-grown eggplant, so that I can taste “the freshness”. will you come over and make eggplant for me so that i’m not afraid of it anymore??!?!! this looks so good. but i’ve never prepared eggplant before, so i’m nervous!!!! Now this is the most surprising comment that I’ve read online this year! Girl, you can cook anything, slice that thing up and throw it in a pan and let your mad skills do the rest ;) Although this recipe does look fantastic. Eggplant is one of those veggies that I look at and go completely blank. 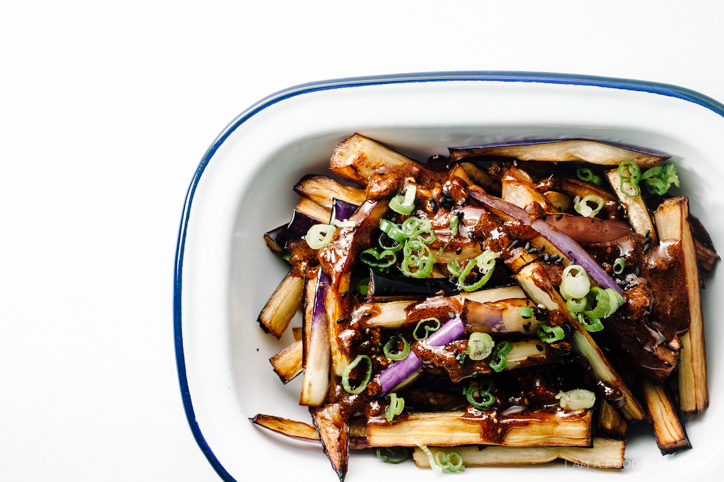 I usually just give into the frustration and make eggplant fries, but I think my last little eggplant at home is getting a little shallow fry, honey garlic love tonight! Thank you for the delicious sounding recipe! I love this story so much!!! Your mom sounds like the best <3 so cute that she buys you groceries (and says things like "taste the freshness"!!!) And I'm also in love with this shallow deep-fry trick! I'm going to have to do this next time I make eggplant. After I try that miso-glazed heavenliness, that is! Mom texts are the best. I’ve even started a #thingsmymomtexts hastag. THIS RECIPE is to die for. I didn’t know anything about cooking eggplants until early this year (take outs are usually the case) and I’m obsessed. I have to try frying it like you suggest to keep it non-mushy. PS. Your book is my bible. That is all. You mom sounds plain awesome! What a gorgeous colour on that eggplant. My love for eggplant came from my mom, she cooked it in so many different ways when I was growing up but this recipe is new. I can’t wait to try! ah brilliant! so THAT’s how you cook eggplant to get that texture! i looooooove eggplant. it’s one of my favorite vegetables. this seems like a really simple, easy prep. that warms my heart like nothing else. yummmmmmmm. I feel like your mom and my mom probably shop at the same “buy your asian daughters random groceries” store. (And if they’re really on the twinsies wavelength, that usually means Costco or the Grocery Outlet.) Last time it was mochi peanuts, pop chips and a side of pork belly. Not that I’m complaining AT ALL. Also, this looks fantastic and like all my eggplant dreams have come true. Fried, creamy, saucy perfection. You make me want to love eggplant with this!! Holy freakin yum!! I love eggplant in any way, but this one is so awesome! It reminds me of one of my favorite selections at Chinese restaurants. <3 So soft and chewy-ish inside. 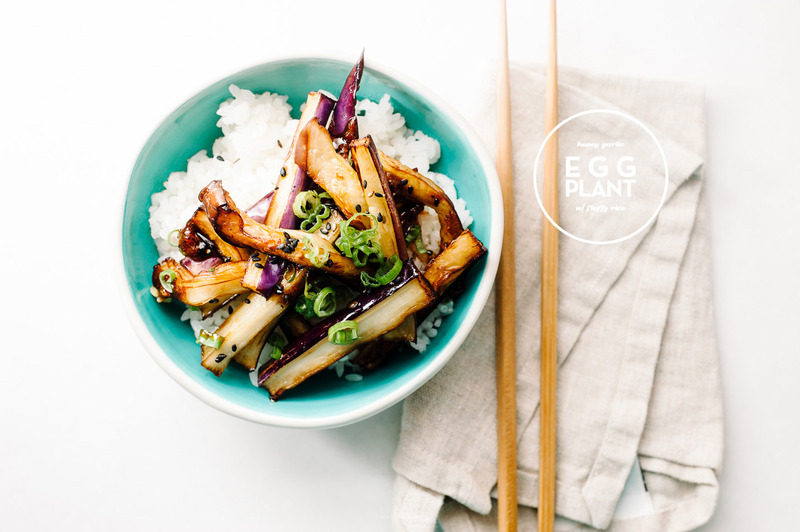 We’re on an eggplant kick right now, totally need to make this! Yes!! I once had eggplant fries sprinkled with spices and drizzled in honey. I know this is different, but I can personally vouch for the delicious combo that is eggplant + honey. Eggplant is my favorite veggie ever!! And this looks spectacular. Simple and perfect. My mom gives me grocery (or random gifts) allllll the time too, she even mails me stuff, and she only lives 20 minutes away, haha. Your recipes and photos are so inspiring!! I’ve already been to Amazon and ordered your cookbook. I am addicted to wonderful cookbooks — I read them like novels. Oh, this sounds so tasty! I love eggplants although sadly my boyfriend hates them so I don’t cook them very often. But next time I’m having a solo lady dinner, this is what I’m going to make! I have never seen eggplant look so lovely in a dish. The color is fantastic and your photos really capture the striking contrast. I think I’ll try this tonight since I have some beautiful sourwood honey that is a bit powerful on bread but might be great for a pop of flavor in this dish. That looks fantastic!! I love garlic and eggplant! It was meant to be! I just picked some up before I saw this recipe. I can’t wait to make it! This recipe would go so well with all the seafood I love to cook! Thank you! Omg. I love that you fried eggplant and I love that you took such a great pic of the eggplant being fried. I want to feggplant (faceplant into the eggplant). Your mom sounds soso cute and reminds me of my mom! The last time she came to visit me in Houston, she brought kale chips, trail mix, and a Costco flat of peaches all the way from Cali <33 Next time I'll hinthint that she should bring me eggplant ;) That last photo is RIDICULOUS!!! I just recently learned that the eggplant emoji means something naughty. So I’ll refrain, but I just know that I want to leave a comment of just eggplant emojis and exclamation points. Whats not to like about this recipe?!!!!? Neither my husband nor I are very good at making eggplant so we’ve challenged each other to an eggplant dual. I think I’ll make this recipe. I’m convinced it’ll beat him! We made this tonight, and it was delicious! Thank you! Made this recipe and loved it!! I was worried about the eggplant absorbing all the oil so I coated the eggplant in egg & cornstarch mixture before frying… still came out great! Just made this, and it was delicious.